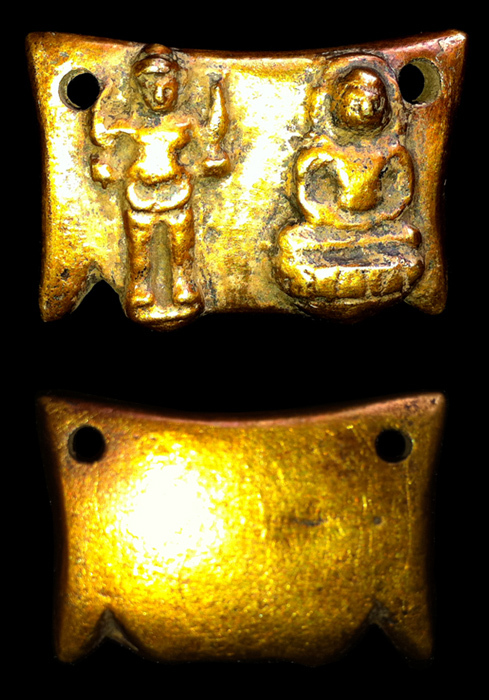 Description: The Buddha is sitting on the lotus throne and the Bodisattva Lokeshvara is standing on the left. The Lokeshvara wears Sampot, which downturned upper edge hides part of the belt in front, is entirely pleated. This gold Buddha, its shape looks like mask-shape in agate beads in Dvaravati culture and can be dated in the end of Dvaravati art in 10th - 12th century.